Every blogger wants to earn maximum money with his blog by using different methods. Most of bloggers are always looking for new ways with which they can Increase their profit which having same traffic. Usually bloggers monetize their blogs with PPC programs like Google Adsense, Chitika or with affiliate programs like Amazon associates, Clickbank etc. In PPC programs you make money when a visitor clicks ads on displayed on your blog. From affiliates you make money when a sale happens through your blog. But today I am going to show you a much easier way of making money through your blog known as (CPM) cost per thousand Impressions. with cpm you make money by just Impression of ads on your blog. CPM networks pays you money for per thousand Impressions. 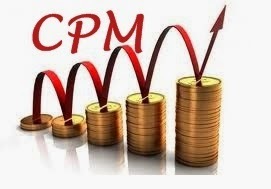 different CPM networks pays different amount from $1 to $4. like in PPC you make more money with American and European traffic similarly in CPM networks if you have Western traffic then you will make more money. Traffic from subcontinent will not make you much Income. you will earn simply when ads will display on your blog no matter a visitor clicks the ads or not. but as I said traffic is the main that will determine that how much you will make and from which part of the world your traffic is coming. If you are looking to use CPM on a blog where you are already using Adsense then you can use only 1 cpm ads below your posts so that It doesn't effect your adsense revenue much.